Care Work considers the current situation of care work and care workers, from childcare to eldercare, and from family carers to paid carers. 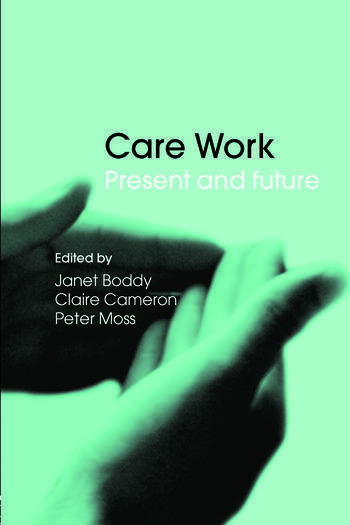 It examines the composition of the current workforce (more than a million in the UK alone), the knowledge and education needed for care work, and the significance of where care work is undertaken (in the home, in institutions). Considering potential challenges and scenarios, the book poses big questions about the future of care work – offering some possible answers. Wide-ranging and innovative, Care Work will be of great interest to academic and policy audiences, and managers or practitioners working in health, social care, childcare, youth work and social policy. Janet Boddy and Claire Cameron are researchers at the Thomas Coram Research Unit. Peter Moss is a Professor of Early Childhood Provision at the Institute of Education University of London.